If you wish to know how to pick a wedding dress, read the article given below. Check out the tips on buying a wedding dress. An Indian wedding is known for its pomp and show. It is a grand affair, which is of utmost importance in the lives of people. In effect, a lot of attention is paid to all the aspects, to make the wedding a memorable event. This includes the wedding dress as well. Though both the bride and the groom wish to look their best on their wedding day, the focus is always more on the bride. It is for this reason that a wide variety of wedding dresses are available in the market, to pick from. A wedding dress for the bride is not just another aspect of her wedding. It is everything to her. Without a grand wedding dress, a bride does not feel like a bride. Of course synchronized accessories and perfect hairdo and makeup matters as much, but none of it has an importance as great as that of an immaculate wedding attire. Women go hysteric trying to find the wedding dress that can set them apart from all the other brides; the one that makes them look unique. When a girl is young the first thing that she dreams for herself is to get married one day and to look memorable on her wedding day. But to get your dream wedding dress is not an easy task, it calls for skill and patience. If you do not know how to get your hands on that flawless wedding gown or saree or lehnga, then you have come to the right article. To know how to buy a wedding dress, read the tips given below. 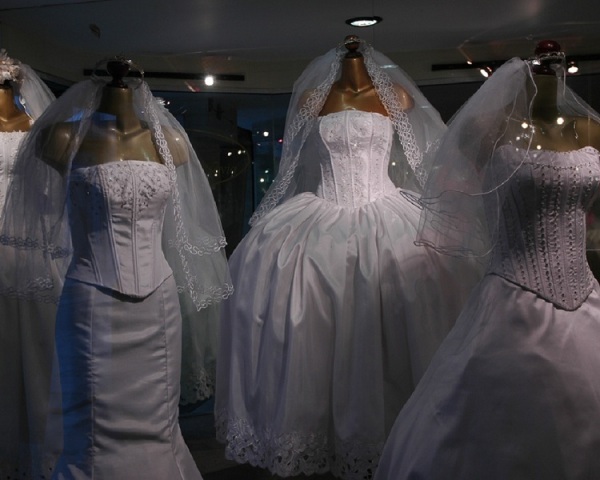 Type:T he first thing to do is to decide, which type of dress you want to wear on your wedding. There are many options available for an Indian bride. You can choose amongst a sari, lehnga choli or salwar kameez. This is also decided by the religion and community the wedding couple belongs to. Of course if you belong to the Christian community then what you are looking for is an unblemished white gown; may be one with a trail that your flower girls will hold on to so dearly. If you belong to the Muslim community then it is sharara all the way for you; some Muslim brides also prefer a ghagara these days. Season: Season is yet another important aspect while choosing a wedding dress. For summers, avoid a heavy, long sleeved dress. Choose fabrics such as chiffon, georgette, net, etc. For winters, you should go for fabrics like silk, tissue, satin, velvet, disheen, etc. Also, summer is the season to experiment with the colors. Do not stick to the traditional red or the shades of maroon; test the unknown territory of neon colors or shades of pink, purple or orange. In winter of course you can stick to the warm shades and different tinges of red will be perfect. You can also go easy on the embroidery work or stone work on your wedding dress in the summer season. Rather you can experiment with the cut and flow of the dress instead of what kind of work it has on it; reason being, it will go easy on the eye. Styles: There are a variety of designs and styles available in wedding dresses. One can choose from fish-cut lehnga, A line lehnga, skirt type lehnga, straight fit lehnga, etc. Same goes for a saree. If you have decided that you want to don a saree on your wedding day then the next step is to decide what kind of saree would you like to wear and what kind will go well with your body shape. If you are petite then anything that sticks to your body and flaunts your figure will be perfect or if you have an hourglass kind curvy figure then you can safely put your money on a beautiful golden Banarasi saree. For the white wedding you have too many choices in white gowns; from off shoulders to a backless one to the one with intricate lace work all over. Body Shape: Make sure you keep your body shape in mind while deciding the style of your wedding dress. Curvy girls should go for slim fit, straight lehngas while thin girls should choose a voluminous, flowy dress. Budget: Budget is also a vital part of buying a wedding dress. There is a wide range of dresses available in the market that suits all pockets. Deciding a price range helps you in the selection of dresses, when you arrive at a shop. You would obviously be attracted towards the ones that cost a lot. But it might not be a wise idea to exceed your budget on the wedding dress. It is because the complete look at your wedding day is not just about the dress you wear; it also involves your makeup, accessories, shoes and your hair. You have to invest on these things as well. So when you like some dress too much and it is way out of your budget then look for the one which has the same style and fabric but is available for less. Comfort: One of the most important factors that should be taken care of is comfort. The dress should fit properly and one should be able to manage its weight. Remember, wedding ceremonies can be really long and tiring, so the wedding dress should be extremely comfortable so that you can bear the stress.